The three program areas – training, district hospital support, and advocacy – of NSI emerge from Nepal’s healthcare situation. (1) Nepal has a huge gap between rural and urban healthcare. While people in Kathmandu have ready access to neurosurgery, cardiac surgery, and advanced diagnostic tests, people in rural Nepal face a different reality. 60% of district hospitals don’t conduct any operations1. Rural Nepal has 40x fewer doctors per capita2. Rural skilled birth attendance is 4x lower than in cities3. (2) Public health services are far better than curative services. Immunization rates average 90% and family planning continues to improve4. Nepal is on par with richer neighbors in public health. Public health financial support (including training) at the district level far exceeds that of curative support. (3) Healthcare workers are the center-piece of Healthcare system. Government buildings continue to expand, even while existing hospitals are understaffed, especially in doctors and nurses. Addition of key workers has been shown to transform hospitals. 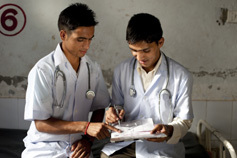 Nepal’s National Health Sector Program has focused on building up the healthcare worker3. (4) Improving healthcare workers requires a diverse approach. In-service training in key areas has had impact on healthcare. Graduates of even the best training programs languish without an enabling environment. Support programs provide feedback to training programs. Advocacy supports other aspects of the program, while feeding on the information that the other programs provide. 2. Nick Simons Institute. Unpublished Data. 2009.